It’s Hot Cross Bun Season! Hot Cross Buns are a tasty snack for any occasion – you can munch on them as you walk out the bakery, toast them with butter, or dip it with your favourite tea. They’re also a must-have on any Easter table – whether breakfast, brunch, coffee or dessert! If you’re looking for even more inspired ways to serve Hot Cross Buns this Easter, we’ve got some traditional favourites and fresh new ideas to try. If (somehow!) 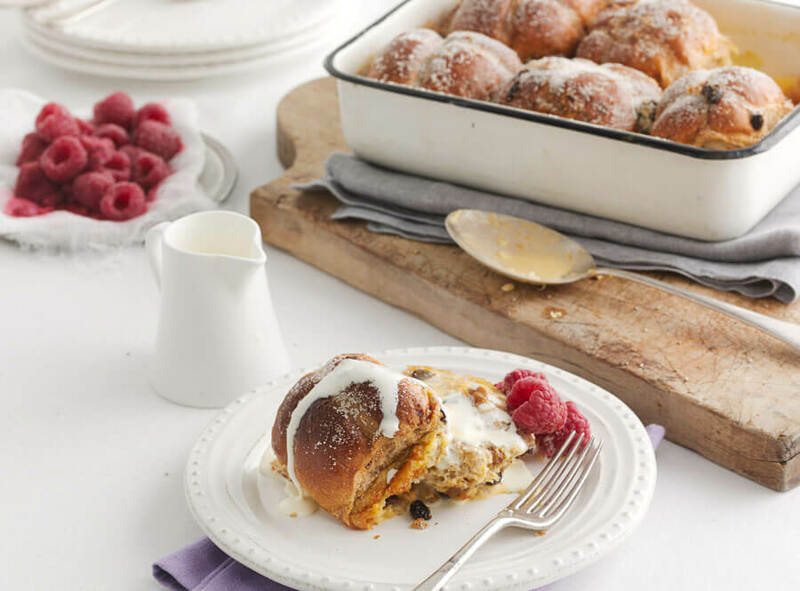 your Hot Cross Buns weren’t eaten in the first few days, Bread & Butter Pudding is a delicious way to incorporate any remaining Hot Cross Buns into a sweet treat for Easter dessert or brunch. Sometimes you want to spread more on your Hot Cross Buns than just butter! Our guest chef, Doris Gnandt, stopped by Global to share some unique spreads for Hot Cross Buns. Apple Butter Cream Cheese Spread: One of the best features of cream cheese is its ability to go either sweet or savoury. With Apple Butter and Thyme mixed throughout, this recipe has a bit of each! Goji Berry Banana Butter: Have you jumped on the Goji Berry trend? By blending these berries with bananas, you get a spreadable treat that’s both bright and sweet. Ricotta & Honey Hot Cross Bun Spread: To add a little protein to your Hot Cross Bun, this ricotta spread pairs surprisingly well with our Cranberry Orange Hot Cross Bun which adds sweetness from the dried fruit.